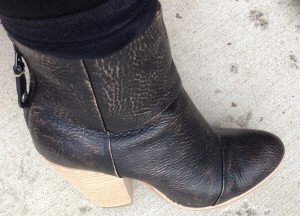 January | 2014 | Footwear Fashionista … a sneak peek into my shoe closet! At first glance, you might think – plain black suede boot with a squared toe – nothing special. And you’d be so wrong! 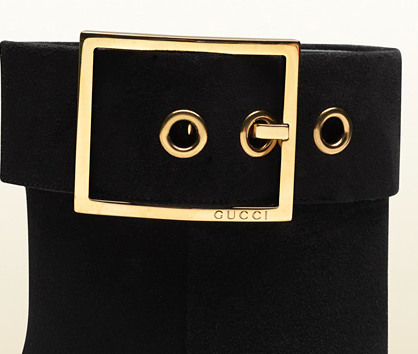 Gucci’s “Kesha” bootie is a class act. A profile glance will reward you with a spectacular vision. The over-sized gold buckle with Gucci logo dominates the sultry suede boot. Minimalist styled, designer luxe. 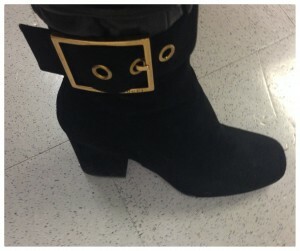 A blocky, 3.25″ squared off modern suede heel compliments the clean look and is easy to strut in. There’s even a metal Gucci logo under the arch of the boot. These shoes will always be in style. A good investment. A great investment if you can find them on sale! Got these on sale from Ssense.com. 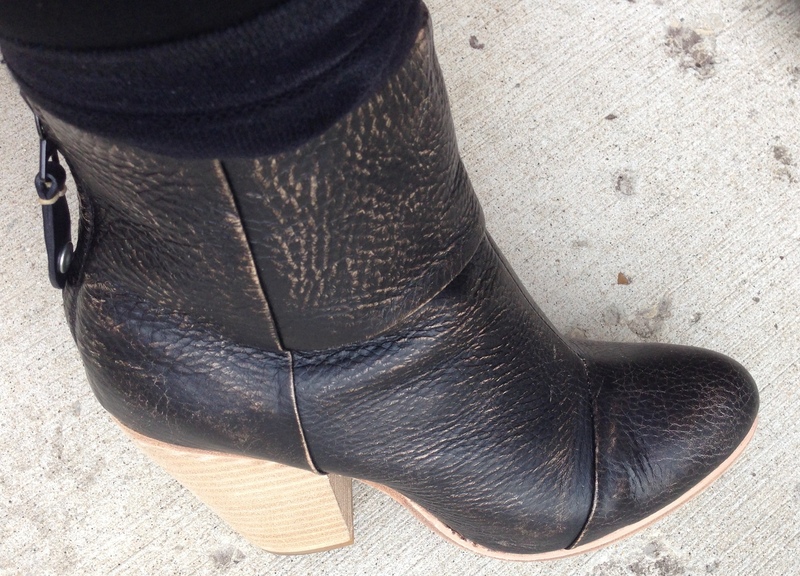 They were held up in customs, weathered through a polar vortex, misplaced by the USPS and then finally 3 weeks later, after several inquiries and trips to the post office … my lost shoes were found and delivered! 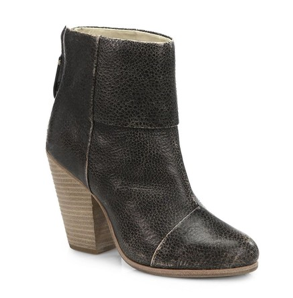 Rag and Bone’s “Newbury”, a distressed ankle boot that adds an edgy touch and pairs well with dresses, jeans and leggings. 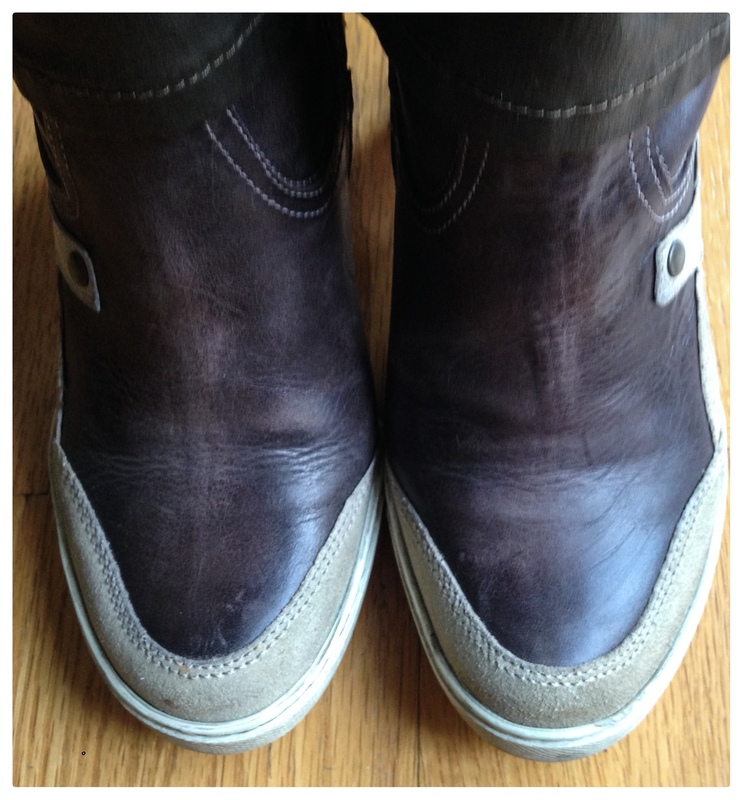 Rounded toe, back zip and 3.75″ stacked, bleached heel adds a nice contrast to the dark worn upper. 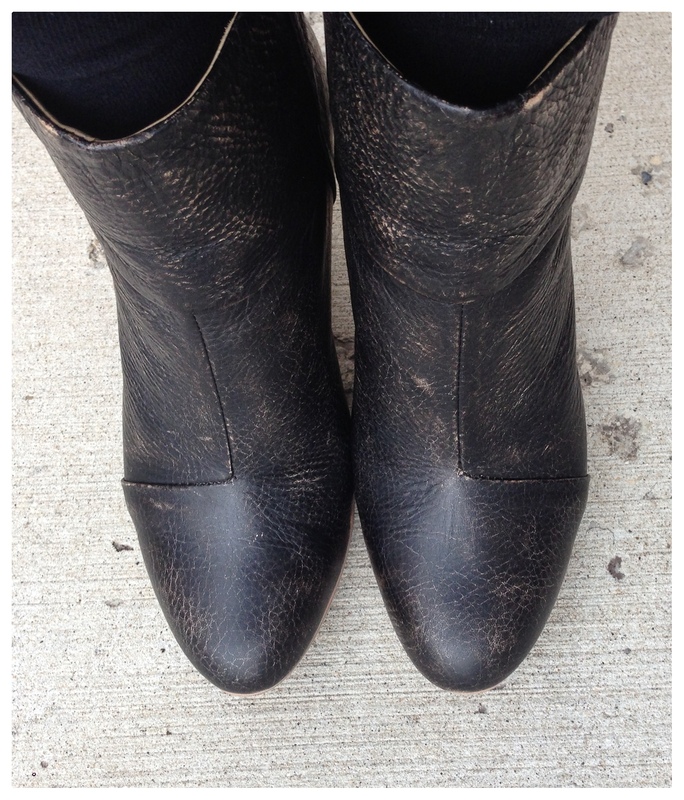 A boot that can only get better looking over time. With snow piled up, pipes freezing and below zero temperatures, the options for footwear accessories in Chi-beria have been severely limited. Now that the temperature is beginning to rise a few degrees, it’s time to put a little fun into the footwear mix. 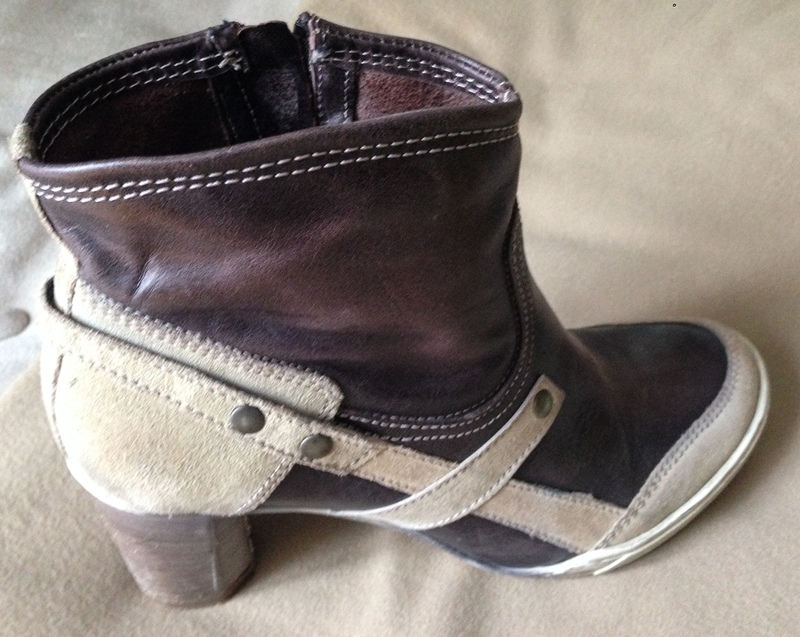 Fortunately MJUS creates distinctive, functional and stylish shoes. This unique brown leather boot, contrasted with cream suede, has a stacked 3″ carved heel and inside zip, yet it’s the white rubber outer sole and midsole that have these taking on a sneaker feel. With a hint of femininity, this progressive boot is casual and comfortable. 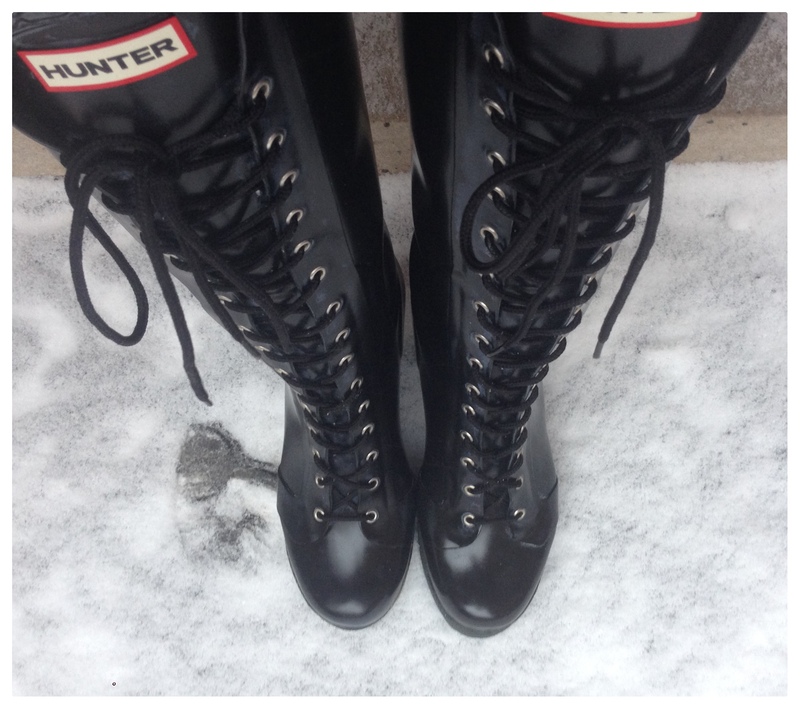 When I first saw these rubber wellies, I loved them because they were different than the standard Hunter boots you see on everyone. The “Lapins” have lace-up detail, a buckled strap, contrasting trim at the back seam, rubber sole, 1″ platform and 4″ heel. Stylish, practical and fun – or so I thought. Now maybe I got a defective pair, but these boots chalk up a lot. 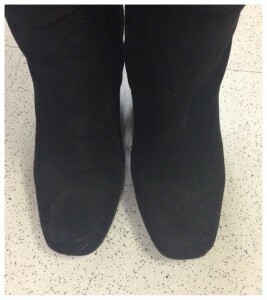 So much so, that it will look as if I’m wearing two completely different boots, one black and one grey. I spent an hour using the hunter buffing spray to clean these, which I think is ridiculously high maintenance for a boot that should look carefree. Wanted to end 2013 and ring in the new year with a little sparkle…from Marc Jacobs Fall/Winter 2013 collection. 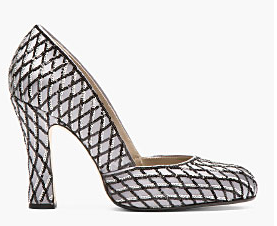 The “Rialto Fishnet Sequined Pump” is a grey silk pump with a rounded almond shaped toe, a 3.5″ chunky heel and adorned with sequins. 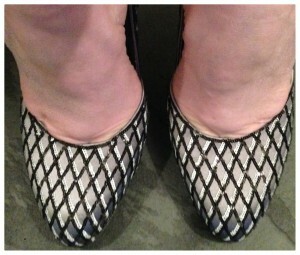 The fishnet pattern is hand embroidered with the tiniest black and white sequins throughout. Having lost 13 vacation days for a work assignment this month easily justified this purchase. The fact that they were also 70% off was an added incentive – thank you Andrew from Marc Jacobs, you definitely know my style! 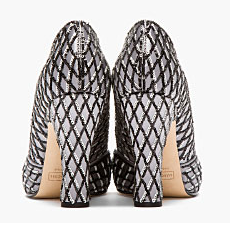 Since it’s snowing, these stylish pumps won’t be seeing the snow covered sidewalks. 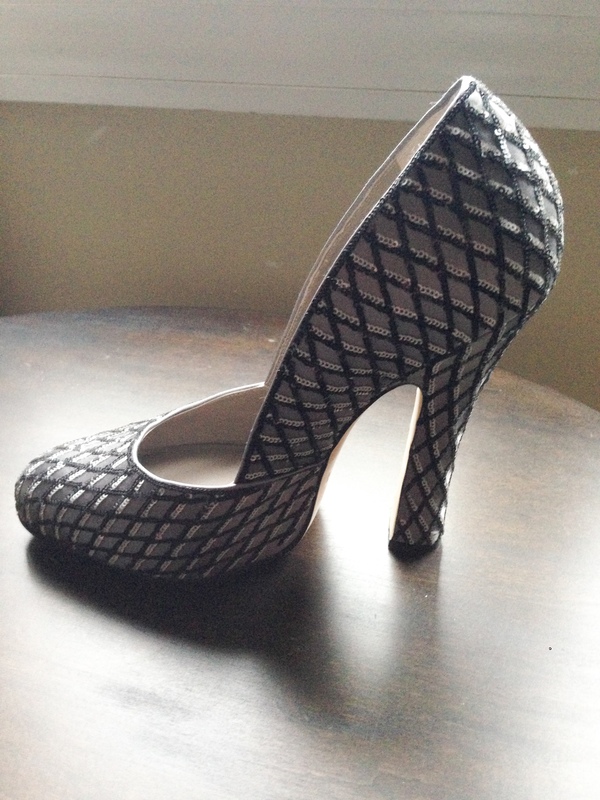 Instead it’s time to celebrate New Year’s Eve by staying in, ordering a pizza, popping the bubbly and enjoying the evening with my nearest and dearest, reflecting on a year gone by and looking forward to 2014…and of course, admiring the beauty of these pumps! Whatever you do to celebrate, be safe, have fun and do it in stylish shoes!